So, yesterday and Tuesday I had my own little pilgrimage to the old Broome Street location, of course, in advance of the Brokie gathering at the end of the month. I was in NYC for a quick business meeting and was staying in Soho with a work colleague. I had plenty of opportunities to walk passed Heath's old building and snap some new photos. It really is a haunting experience to encounter that building. This is the photo I snapped yesterday morning. 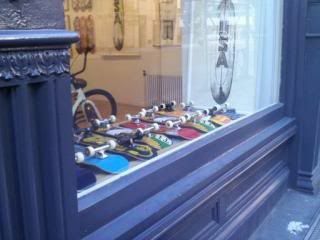 And, I was amazed to see the window display in the shop directly across from the 421 building... it was filled with skateboards! Was that shop there before? I found this to be quite a remarkable thing given the spirit of Heath associated with that street. thanks for the pics, Amanda! And oh, I also went there when I was in NY in July. I find it impossible not to go there when I'm in town, even though I find it...almost morbid and that building gives me the chills. Let's just say that sometimes my imagination is too vivid for my own good and there are things I prefer not to think about. I ordered a very light lunch, in fact I only had a dessert consisting of orange slices sprinkled with...I believe it was cinnamon. Cool, Amanda. I don't think the skateboard store was there last year. Such a jet-setter you are, whipping in and out of NYC like that! Monika, I don't blame you for stopping by 421 Broome when you're in town. There's just a magnetic pull to the building, and the neighborhood, too. Meryl, I'm really sorry I didn't have a chance to visit with you or John this last trip. It was so, so quick and I spent pretty much the entire time at meetings or with my work colleague (even for dinner this time). Can't wait for the Brokie gathering soon! I just hope the weather turns out to be as nice for that as it was earlier this week! Thanks for sharing Bud . 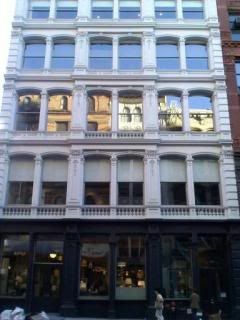 If I were ever to go back to NYC again, I think I'd also go back to Broome Street. Like Meryl, I don't think the skateboard shop was there last year. I walked through Broome Street on my way to the L'Orange Bleue last year and stayed on the opposite side of the street when passing by the first time. Later I sat there with Monica, having a ciggie and glancing over to 421. I think I would have noticed if there had been a skateboad shop. Or someone else of a whole group of Brokies would have. Yeah, I don't recall the skateboard display from last year either. Lynne and I will be staying in that neighborhood again at the end of the month, so we can check it out again. It looked like it was maybe a skateboard / t-shirt / bags & accessories type store. The skateboards kind of gave me chills and also made me happy at the same time. The skateboards kind of gave me chills and also made me happy at the same time. And yay for you and Lynne . The NYC gathering will be so much fun. Wish I could be with you . Now that is a light lunch!